To continue the mask theme around here, with all the talk about ITG's Masked Men printing error, I found myself wanting to get an emerald Jimmy Howard and now I've done just that, and then some. I must say I really like this year's Masked Men design, which is nice because I wasn't a huge fan of the first two when they got rid of the Mask cards. I miss the cropped mask pictures, as those were more about the design of the mask, and not so much the guy wearing it. Between the two, I have to say I like the silver version more, as it kind of pops a little more in the scan than the emerald version, but to each their own. I got both for $15 together. Maybe a little too much, but hey now I know for sure I've got one of each for my Jimmy collection. Now I just need to track down the elusive gold version numbered to 10. As much as I like ITG products, especially the stuff from Between the Pipes, I really wish they would use actual serial numbering on their cards. I mean, it wouldn't be asking too much as they don't have the insane number of parallel versions of everything like UD and Panini. Not that I'm doubting ITG or anything, but how do I know there are actually 100 of these out there? Although, I guess one could argue that even with serial numbering, who's to say there isn't an extra of a given card here and there, I mean that has to have happened at some point right? What do you think? It's been almost four months since I've been able to share any of my custom card designs, and almost a year since my Masked Men custom set. I think you can see from the title why that's significant. I love goalie masks and my Masked Men set was an attempt to showcase some of the cooler masks over the years in the NHL. That being said, since I finished that set I've wanted to do more custom goalie mask cards. That's where the idea for my new custom set, Fractal Masks, comes from. The biggest difference between Masked Men and Fractal Masks is the focus placed on the masks themselves. With this set, I decided to crop out the masks, kind of like the old Pinnacle and BAP Mask cards. As far as the fractal part of the name, that's what I used for the background of each card. However, unlike the Pinnacle and BAP cards, I wanted to find a fractal that worked with each mask, rather than have the same generic background for all of the cards. Fractals come in all kinds of shapes and colors, so they work perfect for this kind of project. Most of the ones from this set from Caedes, a site I've been using for years to get desktop backgrounds. The first thing you might notice that's different than other Masks sets is the inclusion of the goalie's name and the logo of the team with which the mask was worn. This particular mask, worn by former NHL goaltender Scott Langkow with the Krefeld Pinguine of the DEL, features a theme from one of my all-time favorite movies, Transformers. I love the use of the Bumblebee Camaro and nothing beats the Autobot logo. As you can see, there's a nice mix of old and new masks here. If you look close, you can see that the Miller and Tellqvist are the only two that include the straps. This is because those are the only two I cropped from actual photos of the masks in action. The straps are absent from the others because they all came from well-known mask artist David Gunnarsson's website, where he has a nice photo gallery of each mask before the straps are added. Beyond Langkow's Transformers mask, it's hard to pick a favorite from this group. How cool is Lehtonen's Chuck Norris mask, or Ellis' new zombie duck mask? They're all awesome. I'm definitely glad I chose to use a different fractal background for each mask, as it gives the set a bit of variety and color when you put a bunch of them together like this. Now that I've seen these first nine together, I plan on making more, maybe not as many as the Masked Men set, as these take a bit more work. I also plan on including more masks from the European and minor North American leagues, like the Langkow, because awesome mask art is not limited to just the NHL. So what do you guys think? Are these an upgrade over my Masked Men customs from last year? Have any design suggestions or mask recommendations? Sometimes cards are cool because of the picture and overall design on the front of them, regardless of the player being featured. This Shjon Podein from 1997-98 Upper Deck is no exception. I've shown a few cards from this set in the past, and while it's not the best design in the world, I still like it. It's simple and leaves plenty of room for awesome photos like this one. As far as the picture itself, I love it. It's another one of those out of the ordinary shots, in this case another wide angle shot like the Messier I highlighted in my last pick. It's kind of neat that the picture is such a good closeup that you can read Podein's name on the top of his glove. Other than that, this picture gives you an ice-level perspective of an NHL arena, something most cards don't even come close to doing. This just goes to show that it's hard to find better photography than in Upper Deck's main set year after year. I just wish all card companies put a little more effort into finding decent pictures for base cards, because after all, some people actually still collect base cards, although you wouldn't know it in this hobby anymore. This is another flea market find and something I've haven't really seen in the past. I know of the Classic sets, but have never come across any unopened packs like these. 18 of them for only $3, not bad. Right away, these were unlike any pack I have ever opened in the past as the nine cards in each one come pre-arranged in a cheap nine-pocket page. One thing I didn't understand though was that the packs, or sleeves, say "9 cards per sleeve, 1 bonus card in every sleeve," but every pack only had the nine cards. What's up with that? For the most part, all of the cards have the same basic design, and that would be the base version like the Barnaby card. In addition to that, all of the subsets have the same design plus a unique red foil stamp depicting which subset is which. There are actually quite a few subsets, as you can see from the scans. 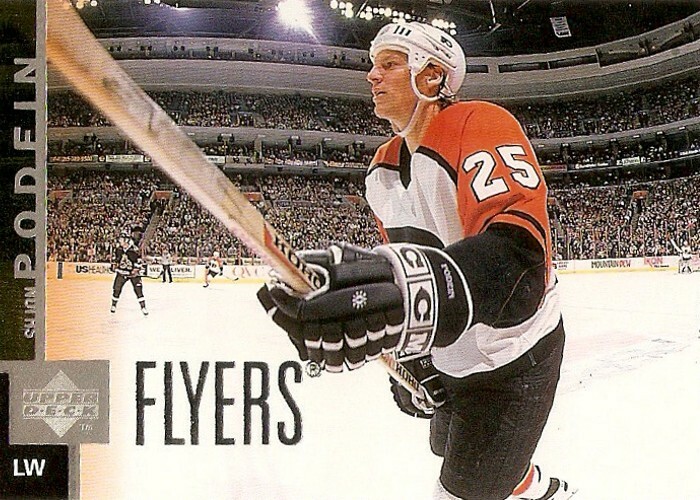 There are things like "The Bonk File" dedicated to one of that year's top prospects Radek Bonk. According to the back, Bonk was the first to play pro hockey at 17 years old since Gretzky and Messier. Some of the other subsets included Class of 94, Best of the ECHL, Honors Grads, and a few others. There was even a subset for the women of pro hockey. 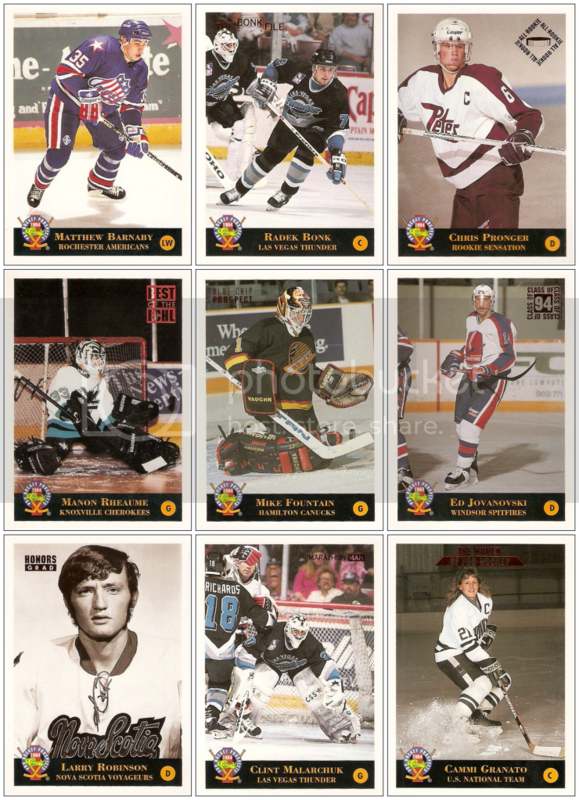 I'm not sure if there are any more cards in that one, as the Granato is the only one I got, although I'm assuming there would be a Manon Rheaume in there too. The middle three cards here are the "Ice Ambassadors" set mentioned on the front of the wrapper, although the actual cards don't have those words anywhere. 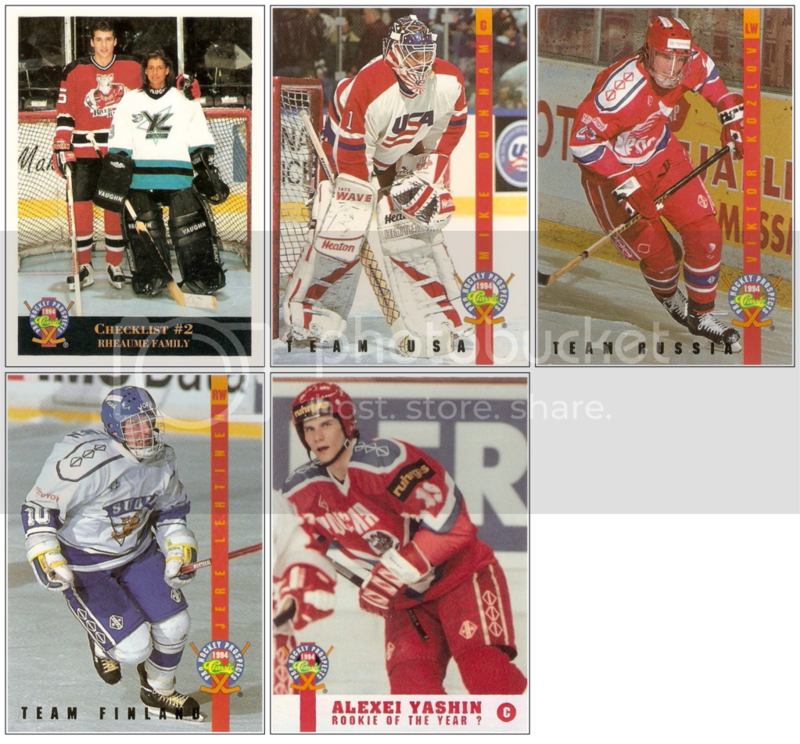 It's kind of weird that I didn't get a Team Canada card as I got quite a few of USA, Finland, and Russia. The last card is the "Rookie of the Year" card also mentioned on the wrapper. It's got the exact same thing on the back, except with Jason Arnott instead of Alexei Yashin. These 18 packs were terrible as far as collation, as I have doubles of probably half of the cards I got, and I think even one or two triples. Overall though, this break was kind of fun. I never realized some of the guys in this set actually played for these teams. This pick is yet another card that caught my attention just because of the photography and not necessarily the design. 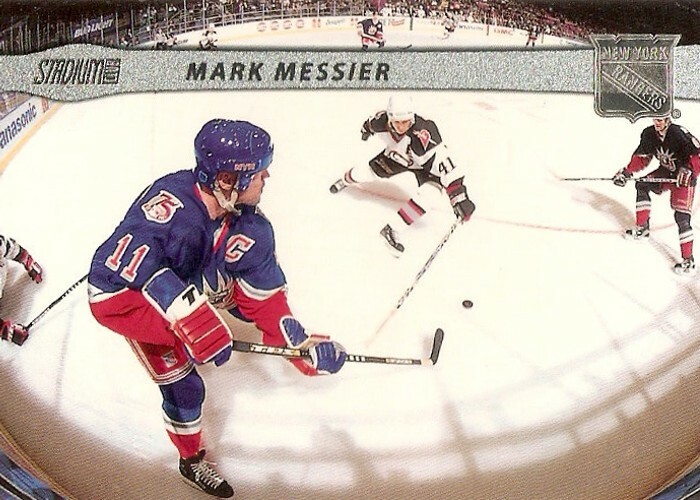 This Mark Messier is from 2001-02 Topps Stadium club and features a great action shot. The first thing I notice about the photo on this card is the camera angle, as it's got a kind of panoramic look to it. It's one that isn't used on the front of cards all the time, although I think it should be. It's really neat to kind of see the play develop on a card like this, when most cards simply feature closeups of single players. In this picture, I can see half the ice and at least eight different players. Now that's an action shot. The design almost takes away from the photo a little on this card, but I guess you're not always going to get the best of both worlds with base cards like this. Despite that, it's beginning to look like this particular set has some of the better photography from that time period. Just take a look at this Scott Gomez I featured as my 51st pick back in December. Recently, it came out that In The Game made a huge mistake with their 2010-11 Between the Pipes Masked Men III set, specifically the emerald versions. There are supposed to be 340 of each emerald version, but each emerald card has "1/1" written on the back. "There is an explanation for this event but not an excuse. The card went through the normal proofing process that all our cards do before they are released and no one caught the small 1/1 designation. Probably because they were not looking for it. 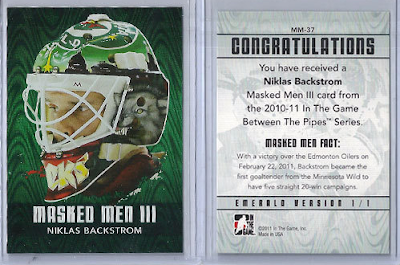 There never was supposed to be a 1/1 Masked Men III card in the product." "I know that there still will be issues to deal with. We made a mistake for which we are truly sorry and apologize profusely." First of all, it's nice to see that ITG came out and let collectors know about the mistake, even if it was just before the product went live. While that's all well and good, it still doesn't help the problem we as collectors are going to deal with on the secondary market with all of these illegitimate 1/1's out there. Hopefully, now that this information is out there, nobody will be ripped off by sellers still claiming these are actually real 1/1's. All that being said, do you think collectors would pay a premium for these over any other card similarly numbered (i.e. /340), just because of the novelty factor? I definitely want a Jimmy Howard "1/1" emerald version for my collection just for the novelty of it. This will be the most substantial Gold Script update since I picked up the first ten a while back. These next five are actually parts of two different purchases from ebay. The first two came with the Joe Thornton Super Script I posted earlier, and the other three I won in a package deal for $0.99 each. The first is this Miroslav Satan numbered 016/100. The second is this Ed Ward numbered 070/100. The cool thing about this one is that it completed the first 'rainbow' for my master set project. Check it out here. These next three came together in the other ebay purchase I was referring to. All three plus shipping only cost me about $8. The third is this Wayne Primeau numbered 048/25. The fourth is this Dean Sylvester numbered 005/100. Finally, the fifth is this Sami Kapanen numbered 012/100. Recently I mentioned it was odd that I had come up with nearly twice as many Supers Scripts as Golds Scripts, but this changes things as I now have 19 Golds and 21 Supers. In terms of today's NHL, as opposed to when this set came out in 2000, this is one of the better cards in the set and I got it for what I believe is a steal on ebay: a Joe Thornton /25 for less than $10. I'm not a fan of Thornton by any means, but I'm definitely glad to be able to cross this one off the list. I thought for sure it was going to go for much more than the $9.99 opening bid, but I was wrong and ended up winning it with just that one bid. This is the seventh Super Script I've been able to acquire this year, compared to the nine that I picked up all of last year. That would put me on pace to get nearly 20 by the end of this year. It's also the 21st I've gotten for my set. While I'm making much more progress than I expected since I started this, I still have a ways to go even before getting to the 25% mark, let alone completion. I try to keep my non-card related posts to a minimum, but this was just something I had to share. Yesterday, I was at Perani's Hockey World looking for some roller hockey pants when I came across a rack of older replica jerseys and I just could't pass on one marked 50% off. I've got a decent replica jersey collection, consisting of somewhere around 20-25 at this point. Most of them are Wings jerseys, but I like to vary things a bit, so I try to get other teams jerseys too. There are a few jerseys I've always wanted, and this one was near the top of the list. As you can see by the picture, it's a Dallas Stars replica third jersey from the pre-Reebok era when jerseys were actually cool. I love this jersey because they tried something different and unique, something you just don't see much of with jerseys today. I really like the color scheme too, it just works. The logo is great too. 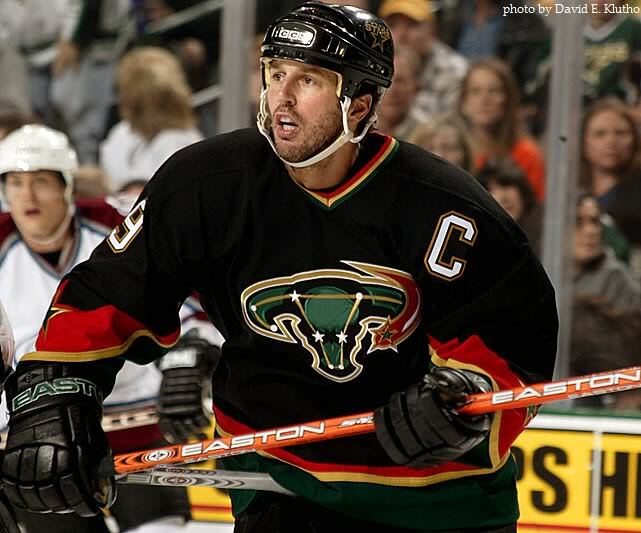 A lot of people consider this to be one of the worst jerseys ever, but I really like it for some reason. Same goes for the Islanders fisherman jerseys, the Bruins bear head third, and the Coyotes desert-scene third. I hope to someday have all of these jerseys in my collection. As far as my newest addition, right now it's blank on the back, but I'm thinking about having Mike Modano's name and number put on somewhere down the line. So, is anybody else into any of the "worst" jerseys ever like me? Lately, I've been moving all of my scans over to Photobucket, just so I don't use up all of the image space on my blogger account. In the process of doing this, I found a cool way to show off a bunch of cards at once. Check it out. I like this because it's a bit different than just putting together a simple set map, plus you can add the titles to each cards. Pretty cool if you ask me. I haven't added much of anything to my Jimmy Howard collection lately as I've been focused on tracking down cards for my MVP Stanley Cup Edition master set project. These next three cards were a pleasant surprise included with the lot of Silver Scripts and Stanley Cup Talent inserts from reader Mark. The first one was this base card from 2010-11 Certified. It seems backwards to me, but I got the Gold /25 and Gold Auto /25 versions of the card well before the base version. The second was this base card from this year's Black Diamond set. Like the Stanley Cup Talent cards from my last post, this one didn't scan all that well, but does look really nice in person. The last, and probably my favorite of the three, was this base card from 2010-11 SPx. Even though the design is extremely busy and a lot of the space is wasted, I like it for some reason. So even though these are simple base cards, I'm really glad to have them as part of my collection, especially since they came as a surprise. They bring my Jimmy Howard collection total to 21 now. 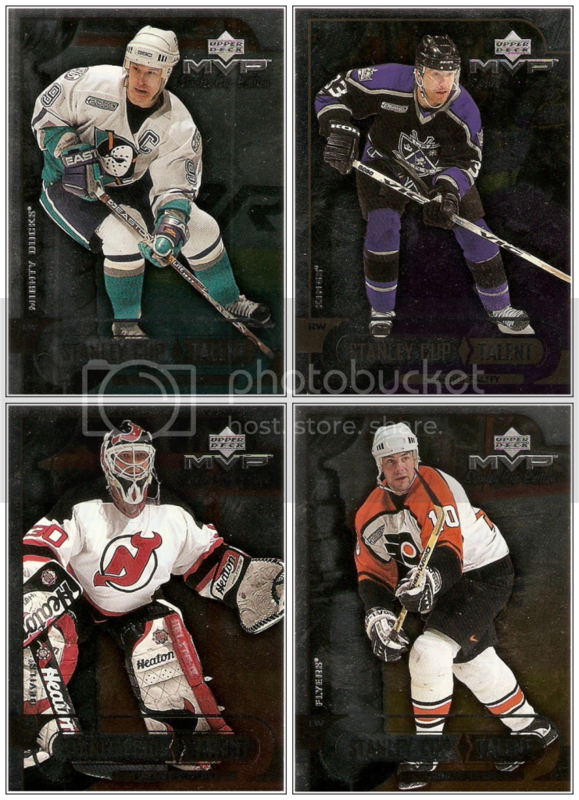 Along with the Silver Scripts he sent over last week, Mark included a bunch of cards from the Stanley Cup Talent insert set, of which I needed these four for my master set. While it's not the best of the bunch from MVP Stanley Cup Edition, I really like the design of this insert set. It's just kind of hard to see in the scan. They look much better in person. These four give me 17 out of the 20 possible for the Stanley Cup Talent set. Now I only need Eric Lindros, Joe Sakic, and Teemu Selanne to complete it. A few weeks ago, I posted a group of Silver Scripts I picked up from reader Mark. That was the single largest addition to the set, and it put the Silver Scrip set over the 100 mark. Well, Mark was kind enough to hook me up with a few more Silver Scripts for the set, plus a few others, which I'll share later. There were these nine plus a Denis Shvidki, but I didn't feel like wasting two spots in a single row for just one extra card, plus nine cards together like this just looks right. A tenth would just look odd. My favorite of the bunch would have to be the Jyrki Lumme, just because of the jersey he's wearing. I always thought that particular Coyotes third jersey was awesome and I've always wanted one. So, these ten bring the set total to 111/220. This means I am just past the halfway mark now. Only 109 left to track down now. These next two were part of the ebay purchase that brought me the Hejduk Super Script. I still find it hard to believe I have so many more Super Scripts than Gold Scripts from this set, but this and one other ebay pickup I'm waiting on should help that. At least with the Gold Scripts, as opposed to the Super Scripts, the signatures are always perfectly visible when scanned. Both McAmmond and Woolley have nice looking signatures, assuming they're exact copies of actual signatures. The best part about this pickup is that I only paid $1.49 for each of these two cards thanks to combined shipping. Otherwise, I would've paid $3.50 to ship each card individually and I hate when the shipping is more than the final price of the card like that. These two bring the Gold Script set total to 14, not far behind the 20 Super Scripts now. Overall, I now have 355 out of the 880 possible between base / silver / gold / super, which is just about 40%. Ok, this card I do actually own. It's a Milan Hejduk Super Script numbered 10/25. I got this one in a package deal with two Gold Scripts on ebay the other day for around $20. Not bad if you ask me as these things are still pretty darn impossible to track down. It's the sixth one I've picked up so far this year, so I'm on a much better pace than this point last year for this set. At least on this one the rainbow foil signature is actually visible in the scan. I guess it just depends on how the light from the scanner hits it, as the last few haven't come out so nice. This one brings the Super Script set total to 20. Seeing that I've only been actively pursusing this set for just over a year now, I'd say that 20 out of 220 is pretty good, considering how rare these things are. I haven't busted any packs in a while so I decided to stop by the LCS yesterday and settled for a single pack of 2009-10 SP Authentic. I usually stay away from the high end packs, but I am definitely glad I got this one. Check out what came out of it. Best pull of my life, by far. So much so that the rest of the cards from the pack are irrelevant. I have to say, I really love the design of this card. It's got a great color combination and the blue ink on top of the team logos is just awesome. I think the only thing I could go without is the underscore between the player's first and last names. 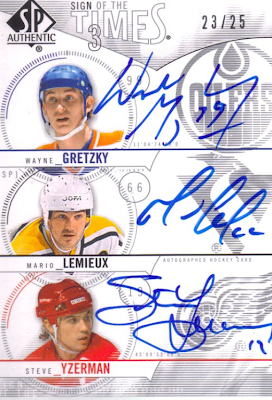 As far as the autos, I think Yzerman has the nicest of the bunch, followed by Gretzky then Lemieux. Too bad the Yzerman is a bit cut off on the right side of the card though.